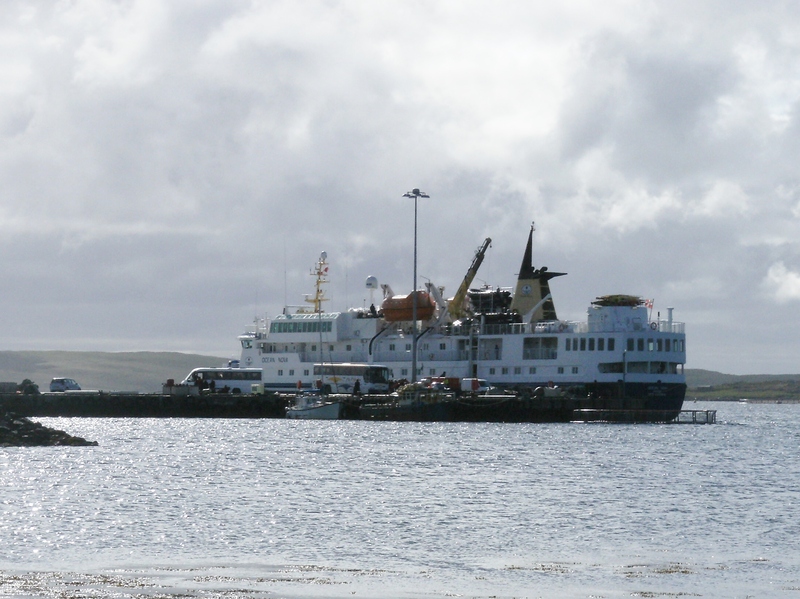 The last two days have been busy with two cruise ships coming to the island and visiting the Unst Heritage Centre. When visitors come and I chat to them, I never know what their interests will be. This time, one group was interested in some of the displays about finishing and dressing; stretching knitted garments into shape. Large boards for dressing shawls would be put outside to dry, especially since the houses were small and room was limited. 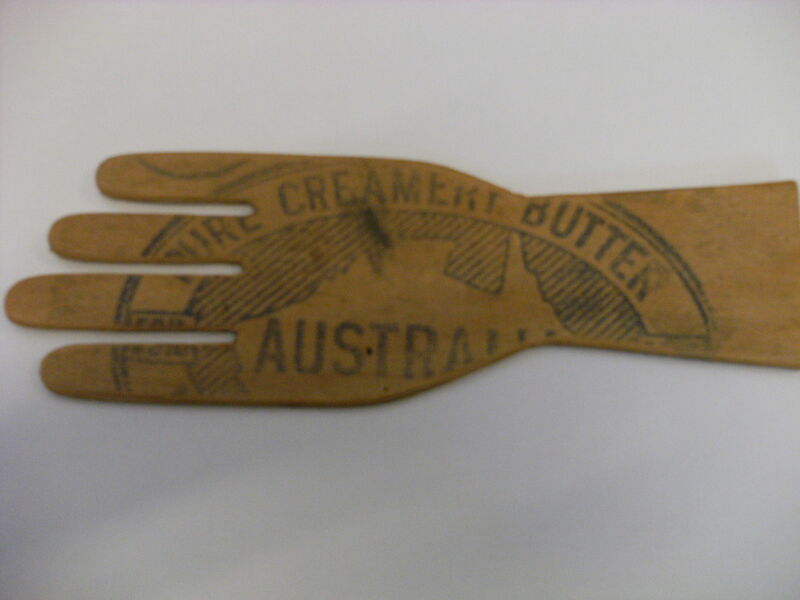 Wood shaped for stretching socks, gloves, jumpers etc was used for the various garments. Since wood was a scarce commodity in Unst, any source of wood would be gratefully recycled into the shapes needed. 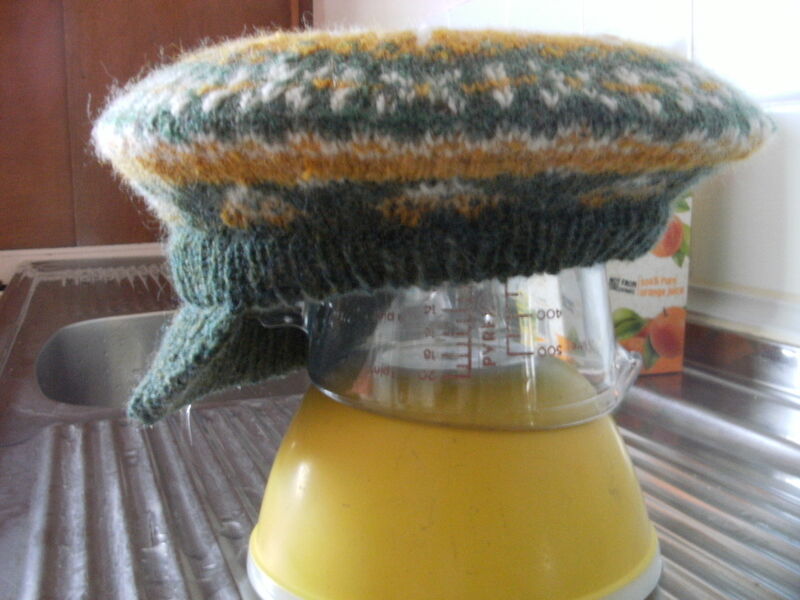 I still have a jumper board and use it to keep our woolen jumpers in good shape. My adjustable jumper board – still in regular use! 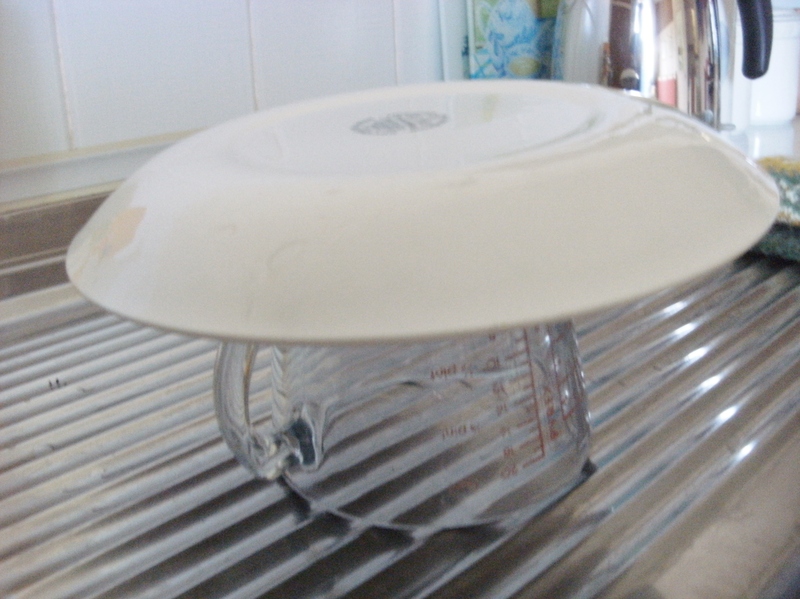 I am currently knitting hats, so I need a plate of the correct diameter for stretching those! 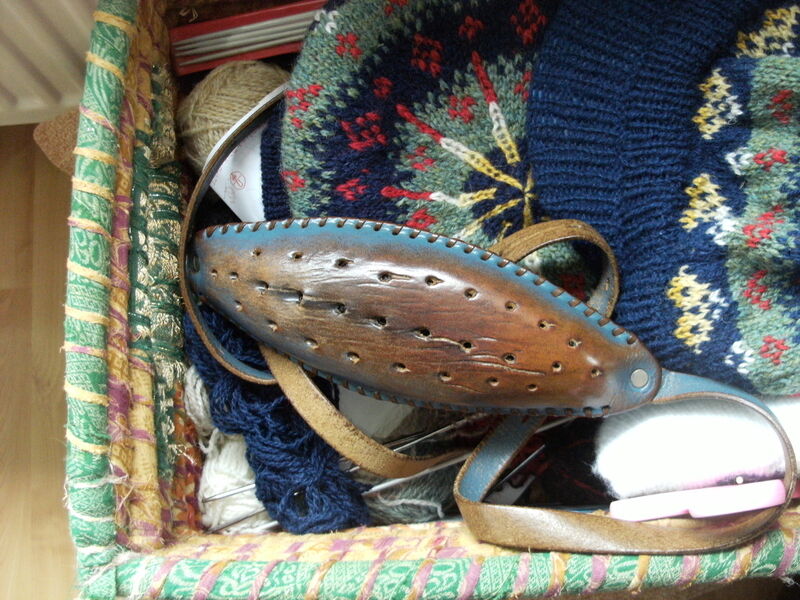 Some visitors were interested in the knitting belt that we still use here in Shetland. 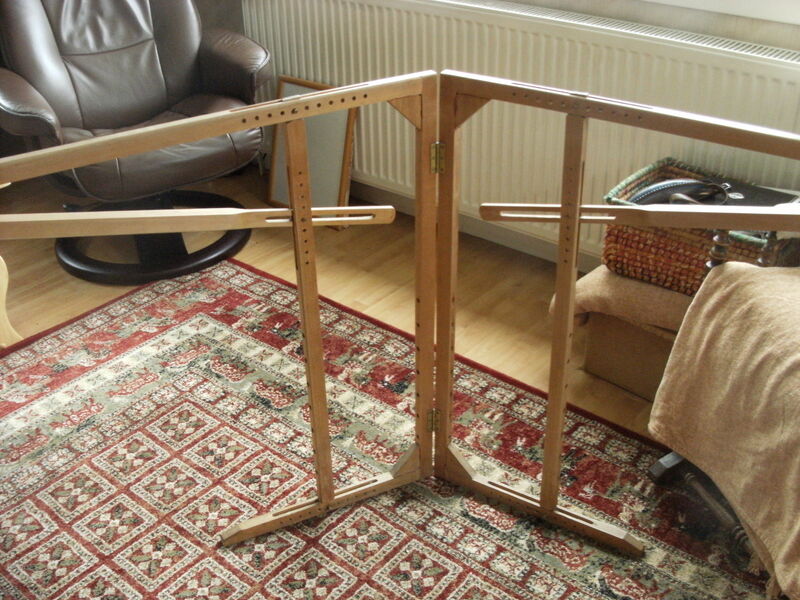 It fits around the waist and helps the knitter steady their knitting and keep the tension even. I have always wondered how widespread the use of the knitting belt was. I would be interested to know if anyone has researched this subject. 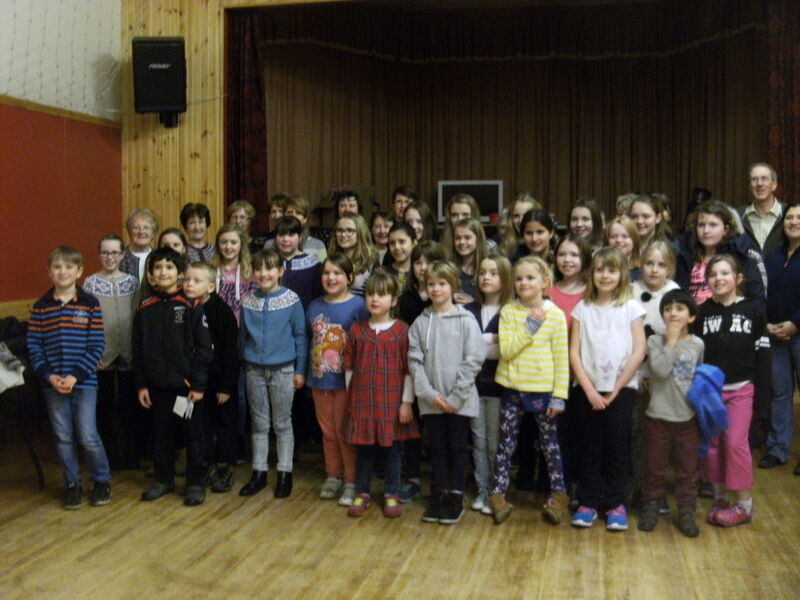 Recently the young knitters from the island of Whalsay came on a visit to Unst to meet our peerie knitters. They were accompanied by adults who help and teach in the two groups. Some of the ladies from Whalsay who came to help. The day was arranged in such a way that the children moved round in small groups with children from both islands in the each group. 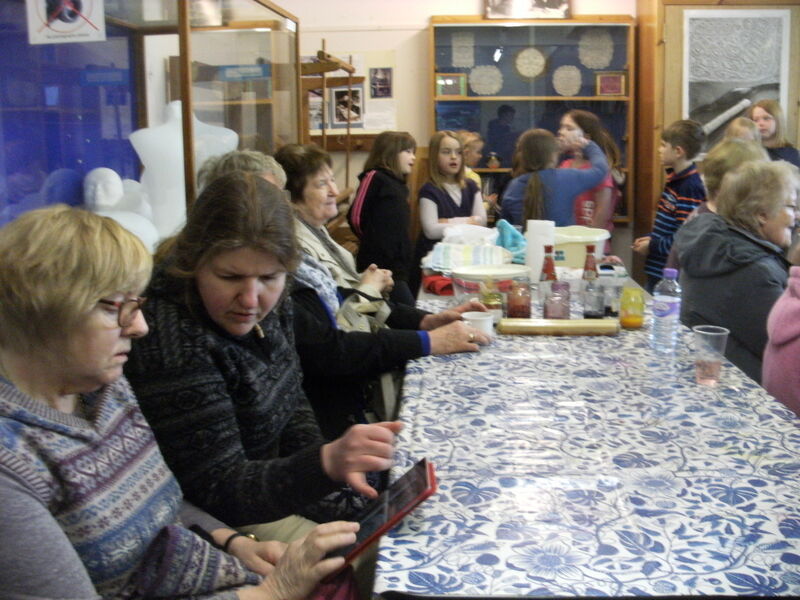 Activities included spinning, dying wool, finger knitting, crochet, knitting. Members of Unst spinners and knitters group were there to help the groups. 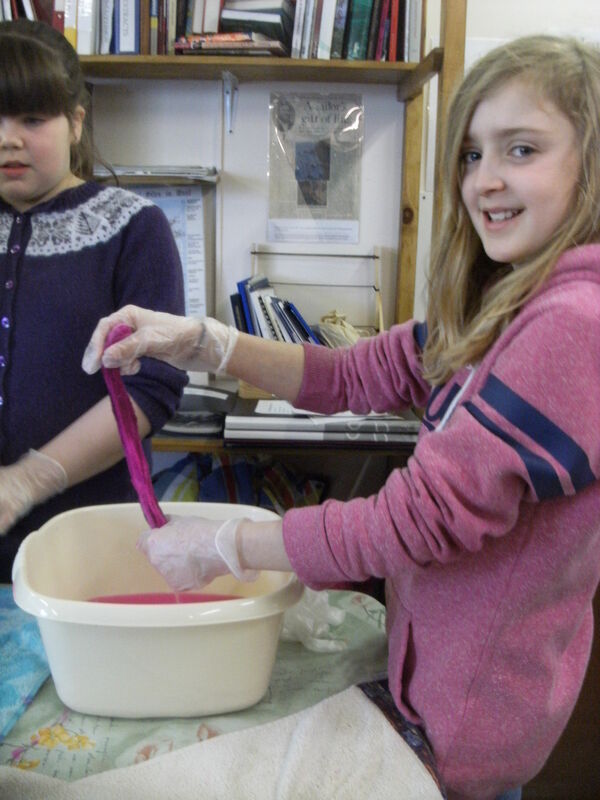 Having an opportunity to dye wool proved popular. 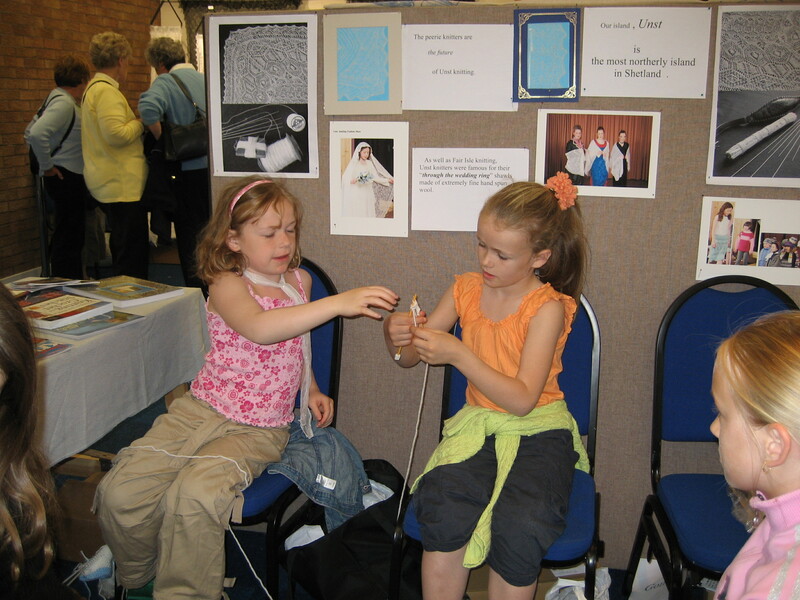 The children could also see the fine lace knitting on display in the Heritage Centre. 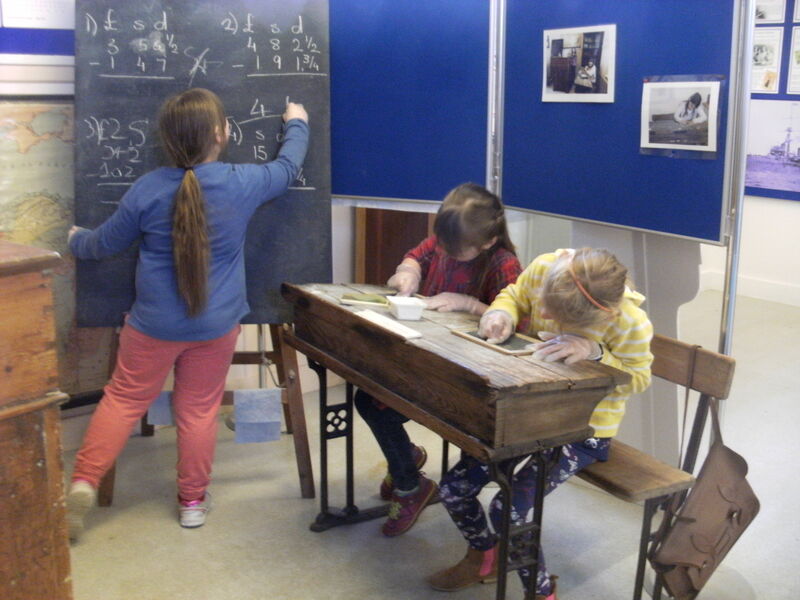 They especially seemed to enjoy the school section of the Heritage Centre displays! Lunch was supplied from the nearby tearooms and enjoyed by all. Thanks to everyone who made it an enjoyable day. 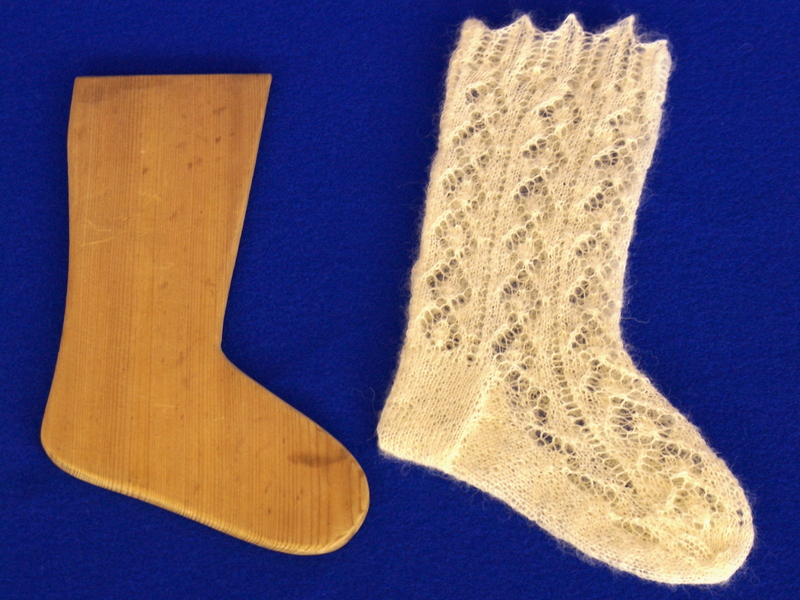 I’ve written a number of blog posts about James Thomas Irvine Moar, the invalided man who taught himself to knit. The last post ended with me sending off the details to the Correction of Errors Section at New Register House in Edinburgh to get his Death record updated to include his parents. My evidence included the above blog posts where I’d gathered everything I knew about him. They replied fairly quickly to let me know that the correction had been accepted, but that it would be a number of months before the amendment would appear in ScotlandsPeople for everyone to see. Before we can correct an entry in the Registers, we must establish that an error has been made & therefore ask to see some form of documentary evidence. Before we can correct/insert a person’s parentage on a death entry we would require to see their statutory birth entry. 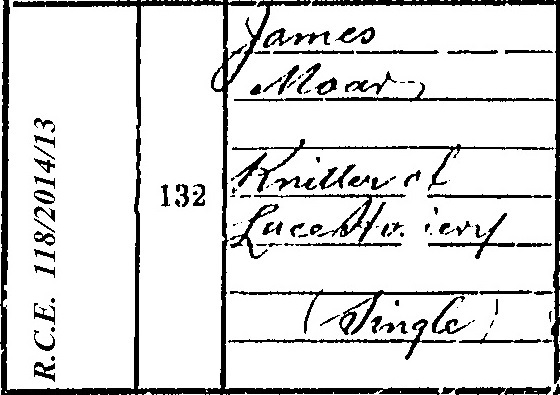 As we have James Moar’s statutory birth entry I can add the parents’ particulars no problem & also insert James Moar’s middle names (Thomas Irvine). 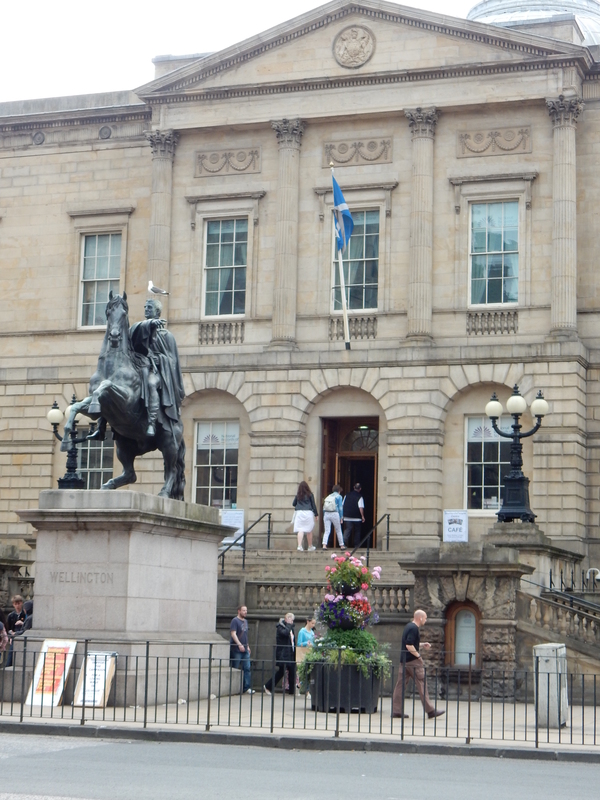 This week I was back in Edinburgh at the ScotlandsPeople Centre where you can view all the records (and purchase and download any that you wish to keep a copy of), so I looked up the Death record that I had previously found. And there it was, the marker to note that a correction to this record exists in the Register for Corrected Entries (RCE). The system I was using to view the record in the ScotlandsPeople Centre also provides a link to the RCE, so I clicked on it and there were my corrections. It was great to see James now properly recorded for posterity, only 100 years late! The Peerie Knitters group at the Baltasound School in Unst is an after school club that has been meeting for the past 15 years or so. Unst Peerie Knitters at work. Running for the past 15 years. 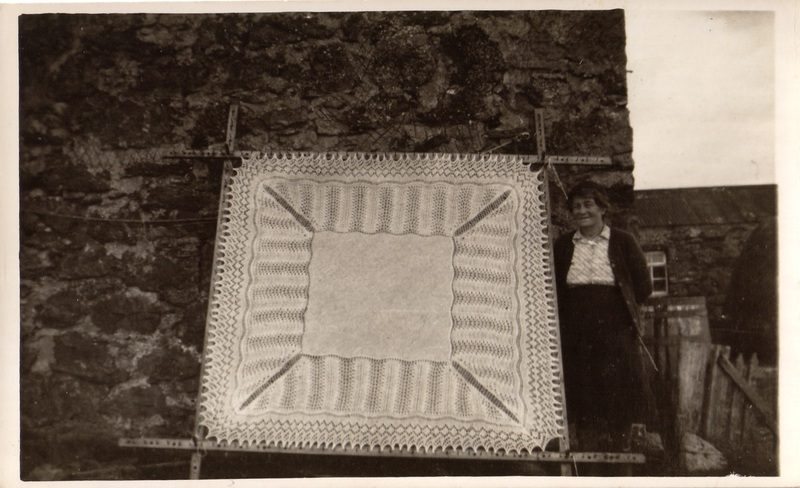 Knitting in Unst in the past was an economic necessity. Many women were living on a croft, which was seldom large enough to provide a living for a family. 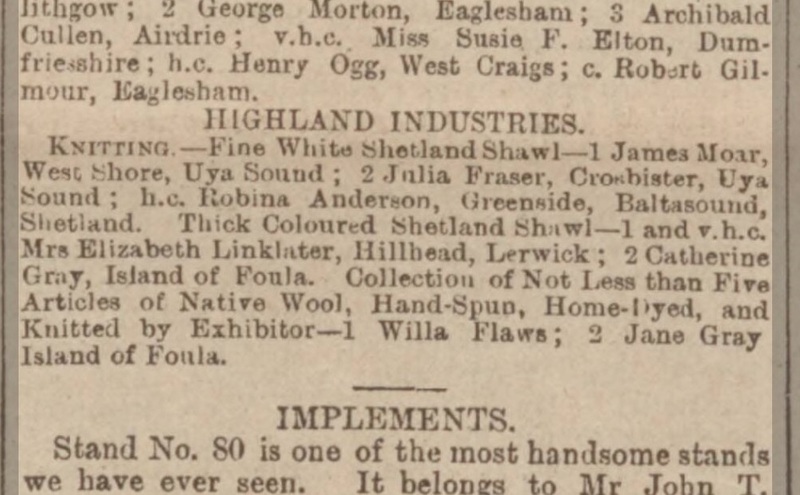 Out of necessity too, most of the men were crofter/fishermen, leaving the womenfolk to tend the croft and knit in every spare moment to support the family, for the fishing too could be very uncertain, especially with the Truck system in operation. Mothers and Grannies have always taught their bairns to knit, as they too could contribute to the family as well as helping with croft work. Until recently there were knitting teachers in Shetland Schools, till the Education Authority in their wisdom decided to cut this vital service. 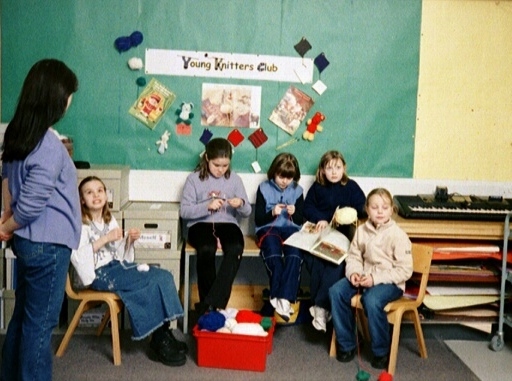 Over the years the Peerie Knitters has taken part in a variety of activities. 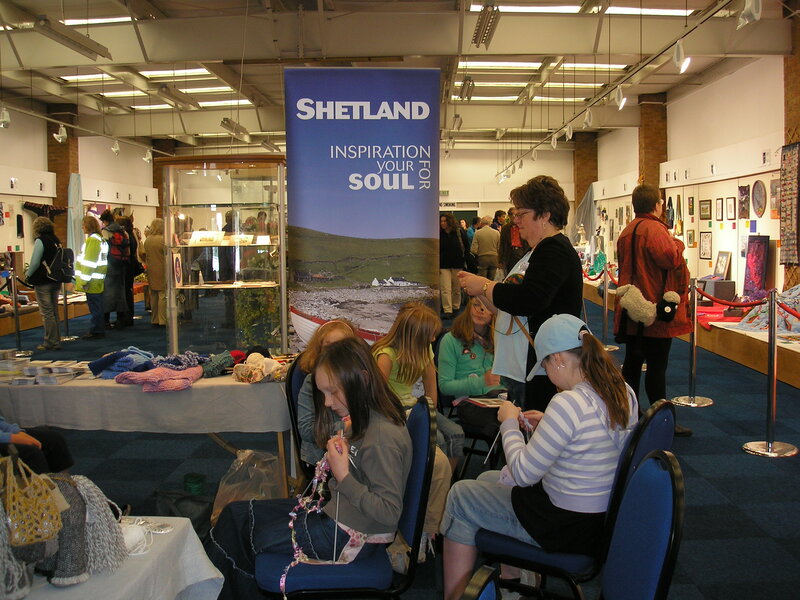 One year a group was invited to the Royal Highland Show and demonstrated knitting to other young folk. Our stand at the Royal Highland Show. Showing others how to knit. 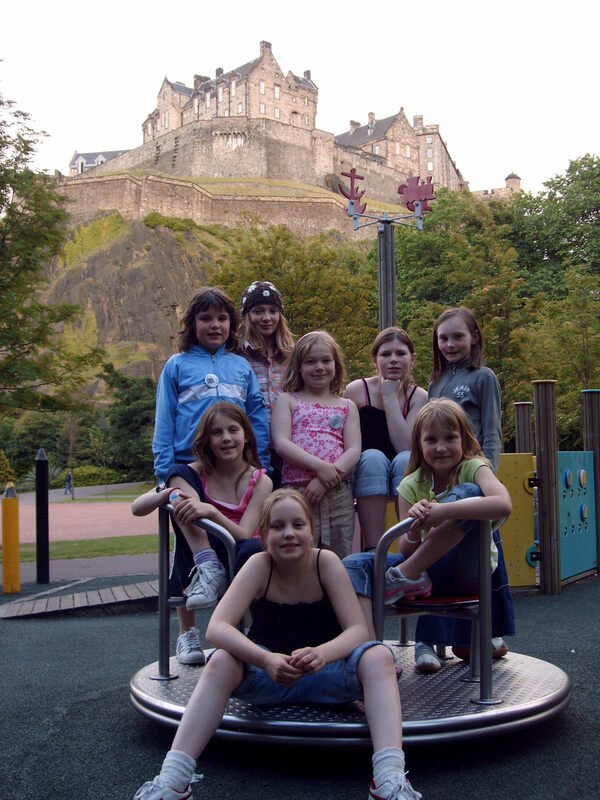 Enjoying the visit to Edinburgh. 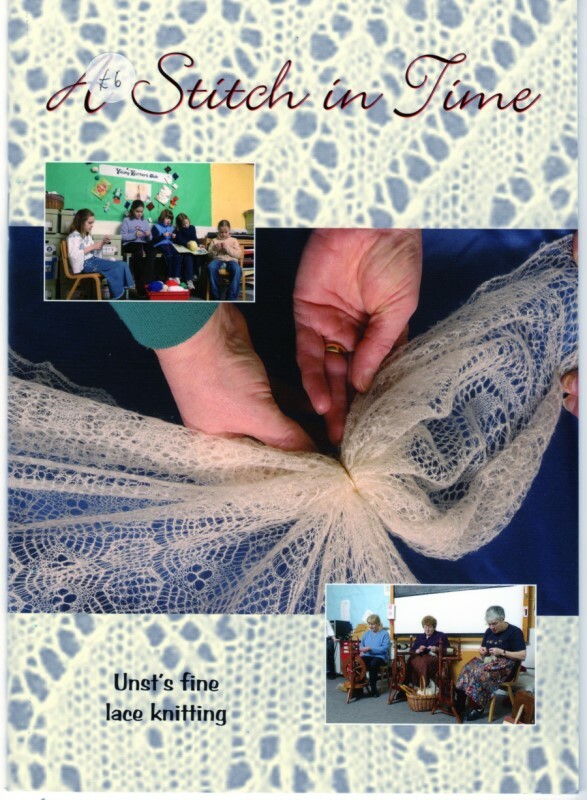 “A Stitch in Time”, a book about Unst Lace knitting created by the Unst Heritage Centre, was published and launched at the Fashion Show event. 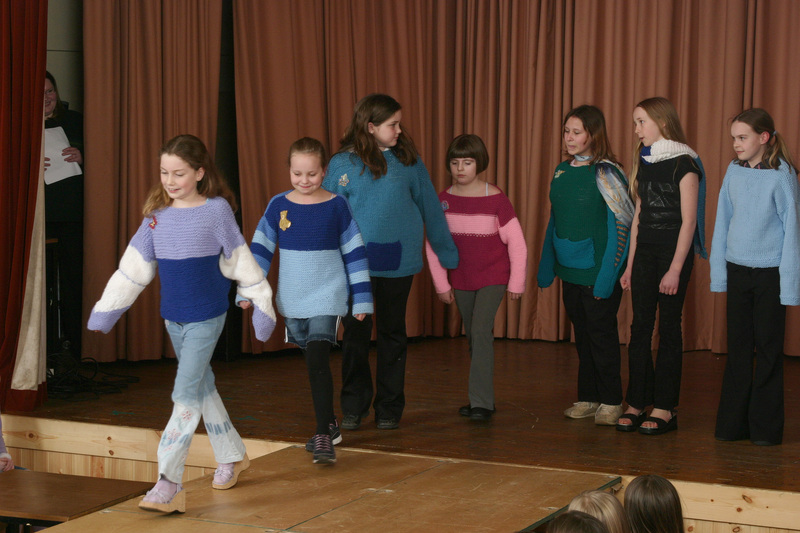 The children made jumpers and took part in the knitwear fashion show “One hundred years of Unst knitting”. 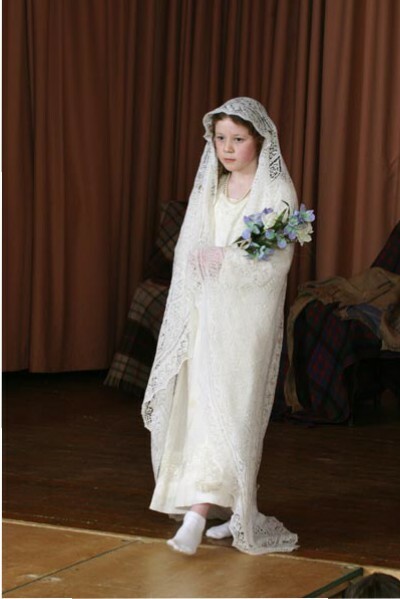 Fine lace shawl for a bride. 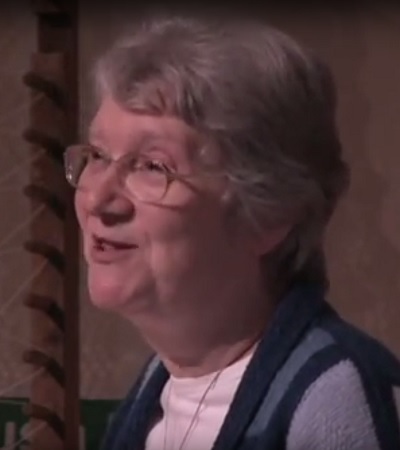 It is interesting to see that, when the local Care Centre has a Knit and Chat evening, the range of ages of knitters attending ranges from a lady of over 100 years to a child of 7 years of age! 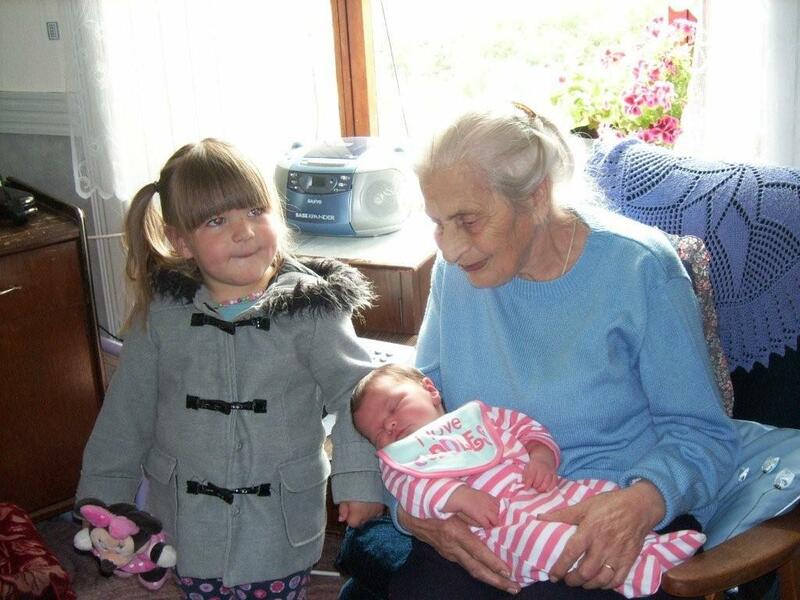 Maima Jean, a lovely lady of over 100 years of age. It is to be hoped that the special knitting skills for Unst’s fine lace live on in the next generation now learning to knit.